Newbie mistake #1: “Faces of Janus” was my first published book. If you’ve read it (thank you and I hope you enjoyed it), you’ll see how the two-faced image represented the JCorp logo, the lead characters’ internal conflicts, the deceptions encountered, and the disguises adopted. But if you haven’t read the book (WHY NOT? ), you won’t get these references. I am delighted to announce the publication of the second novel in my JANUS PARADISI series, set in the open source Paradisi Chronicles universe. Take a look at both ebooks here. Or read the first chapter of FACES OF JANUS here. In FACES OF JANUS, Angel Flores’ security agents uncover the lie behind Earth’s greatest corporate conspiracy. They fight for places on humanity’s incredible journey. Her lover, Zag, assembles a team of special ops warriors but falls for Katya, an operative with a secret past. Betrayal and secrecy on all sides put the whole plan at risk. The hardest journey is the one on Earth. The stars can wait. 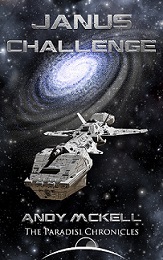 In JANUS CHALLENGE, Angel’s team have maneuvered their way aboard a great spaceship bound for a paradise planet in another galaxy. But the battle is not over. They must seize the ship before the voyage can begin. Their special skills are needed again and again as the journey continues. If you’re interested in becoming a Beta Reader or receiving Advance Review Copies, for future releases, please sign up here.